Download "If you have any questions about how to safely undertake a task or project, ask your supervisor before you begin." 2 2.1 Teaching Laboratory A laboratory where a group of students simultaneously receive instruction in, and perform, experimental procedures associated with a formally approved Carleton University academic course. 2.2 Research Laboratory A laboratory set up primarily to conduct research. 2.3 Supervisor A supervisor is a person who has charge of a workplace or authority over a worker. (OHSA Section1(1)) At the University, this includes all faculty and staff who supervise a laboratory. Deans, Directors, Chairs and other department heads and researchers are supervisors. The department head will appoint a supervisor for each lab. This supervisor is responsible for all matters of health and safety in the lab and will keep the records pertaining to health and safety for the lab. The department head will ensure that on appointment each supervisor attends a Health and Safety for Supervisors training session provided by EHSS. 2.4 Laboratory Worker/User A laboratory worker or user is anyone, student, staff or faculty, who works as a student or for pay in a laboratory, including those who have supervisory responsibilities. 2.5 Unattended Procedures/Equipment A procedure or piece of equipment that is left operating when no one is in the lab. 2.6 Hazardous Agent Any physical, chemical, radioactive, or biological agent that may pose a health or safety hazard to those exposed. 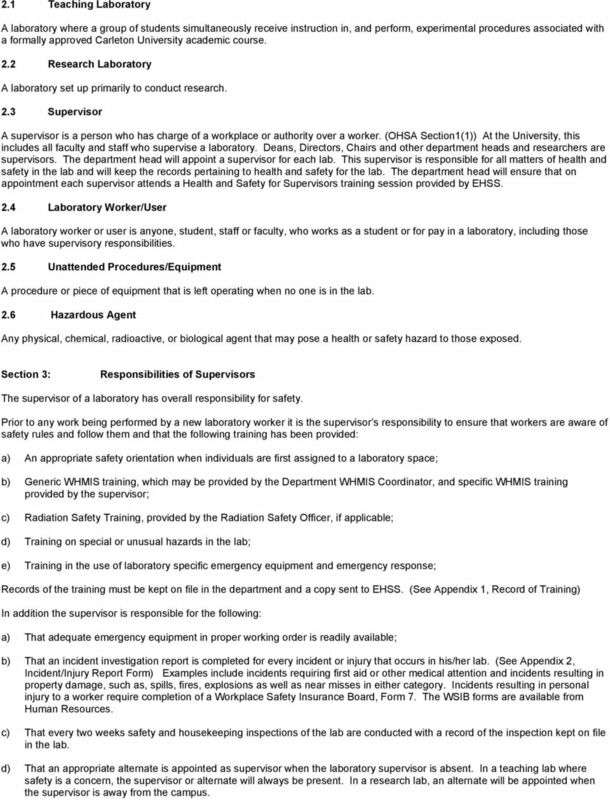 Section 3: Responsibilities of Supervisors The supervisor of a laboratory has overall responsibility for safety. 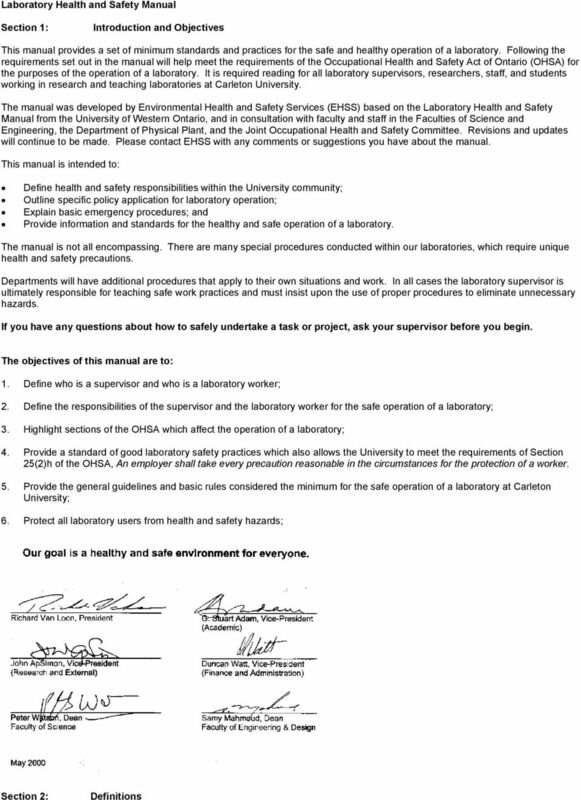 Prior to any work being performed by a new laboratory worker it is the supervisor s responsibility to ensure that workers are aware of safety rules and follow them and that the following training has been provided: a) An appropriate safety orientation when individuals are first assigned to a laboratory space; b) Generic WHMIS training, which may be provided by the Department WHMIS Coordinator, and specific WHMIS training provided by the supervisor; c) Radiation Safety Training, provided by the Radiation Safety Officer, if applicable; d) Training on special or unusual hazards in the lab; e) Training in the use of laboratory specific emergency equipment and emergency response; Records of the training must be kept on file in the department and a copy sent to EHSS. (See Appendix 1, Record of Training) In addition the supervisor is responsible for the following: a) That adequate emergency equipment in proper working order is readily available; b) That an incident investigation report is completed for every incident or injury that occurs in his/her lab. (See Appendix 2, Incident/Injury Report Form) Examples include incidents requiring first aid or other medical attention and incidents resulting in property damage, such as, spills, fires, explosions as well as near misses in either category. Incidents resulting in personal injury to a worker require completion of a Workplace Safety Insurance Board, Form 7. The WSIB forms are available from Human Resources. c) That every two weeks safety and housekeeping inspections of the lab are conducted with a record of the inspection kept on file in the lab. d) That an appropriate alternate is appointed as supervisor when the laboratory supervisor is absent. In a teaching lab where safety is a concern, the supervisor or alternate will always be present. In a research lab, an alternate will be appointed when the supervisor is away from the campus. 3 Section 4: Responsibilities of Laboratory Workers All laboratory workers are responsible for: a) following all applicable safety rules and practices as outlined in this manual and by the supervisor; b) using and wearing personal protective equipment according to instructions; c) reporting all incidents to the laboratory supervisor; d) reporting all unsafe conditions to the laboratory supervisor; e) completion of recommended occupational health screening programs when applicable; and f) attending all training courses as directed by the supervisor. Section 5: General Health and Safety Principles Good laboratory practice requires that every laboratory worker and supervisor observe the following: a) Food and beverages are not permitted in the lab. Consume food and beverages only in properly designated areas. (Ontario Regulation 851 Section 131) b) Use appropriate personal protective equipment at all times. (OHSA Section 28(1)) c) Use laboratory equipment for its designed purpose. d) Confine long hair and loose clothing. (Ontario Regulation 851 Section 83) e) Use a proper pipeting device. Absolutely no pipeting by mouth. f) Avoid exposure to gases, vapours, aerosols and particulates by using a properly functioning laboratory fumehood. g) Wash hands upon completion of laboratory procedures and remove all protective equipment including gloves and lab coats. h) Ensure that the laboratory supervisor is informed of any unsafe condition. (OHSA Section 28 (1)(d)) i) Know the location and correct use of all available safety equipment. j) Determine potential hazards and appropriate safety precautions before beginning new operations and confirm that existing safety equipment is sufficient for this new procedure. (See Appendix 3, Laboratory Risk Assessment) k) Avoid disturbing or distracting other workers while they are performing laboratory tasks. l) Ensure visitors to the laboratory are equipped with appropriate safety equipment. m) Be certain all hazardous agents are stored correctly and labelled correctly according to Workplace Hazardous Materials Information Systems (WHMIS) requirements. 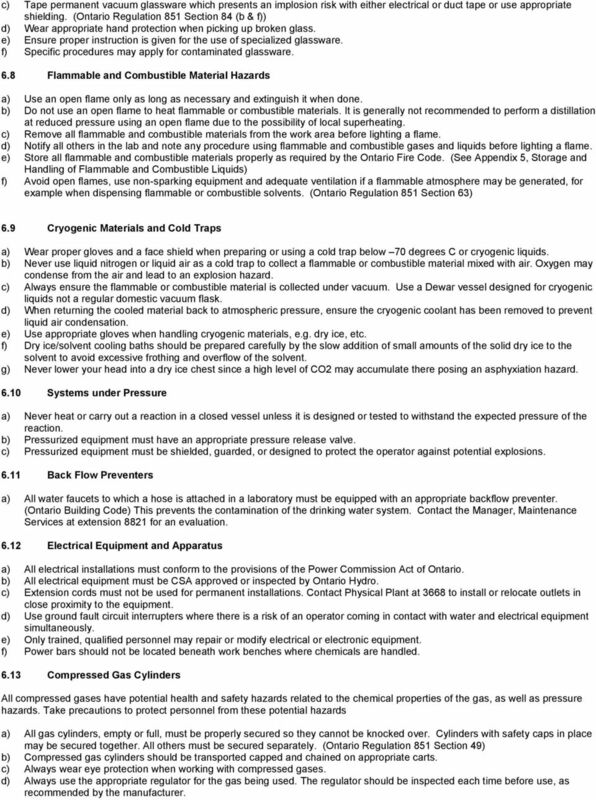 (Ontario Regulation 860) n) Consult the material safety data sheet prior to using an unfamiliar chemical and follow the proper procedures when handling or manipulating all hazardous agents. o) Follow proper waste disposal procedures. (See Appendix 4, Disposal of Hazardous Waste) Section 6: Basic Safety Procedures 6.1 Procedures for Unattended Work a) Unattended procedures should be kept to a minimum. b) An unattended procedure must be visited periodically and a sign posted on the door of the lab outlining the procedure with the name and phone number of a contact person. The sign will indicate the date and time the procedure was started, when it is expected to be completed, and when it was last checked. (See Appendix 13) c) Unattended procedures using cooling water must have the hoses securely attached and the water adjusted to the minimum flow necessary. Ensure plumbing drains are clear before leaving the procedure. 4 6.2 Working Alone a) For safety reasons working alone should be avoided. Someone should always be within call when a laboratory procedure is being performed. b) For work with hazardous materials or procedures the supervisor has the right to require that at least one other person be present. 6.3 Housekeeping a) Work areas must be kept clean and free of obstructions. b) Stairways and halls must not be used for storage. This applies to both equipment and personal property. Bicycles are not allowed in buildings. c) Walkways and aisles in laboratories must be kept clear. d) Access to emergency equipment or exits must never be blocked. 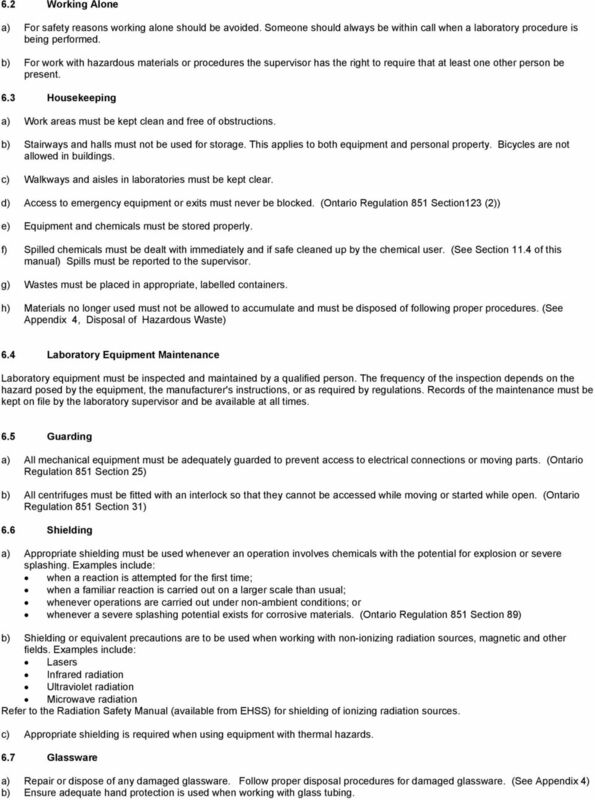 (Ontario Regulation 851 Section123 (2)) e) Equipment and chemicals must be stored properly. f) Spilled chemicals must be dealt with immediately and if safe cleaned up by the chemical user. (See Section 11.4 of this manual) Spills must be reported to the supervisor. g) Wastes must be placed in appropriate, labelled containers. h) Materials no longer used must not be allowed to accumulate and must be disposed of following proper procedures. 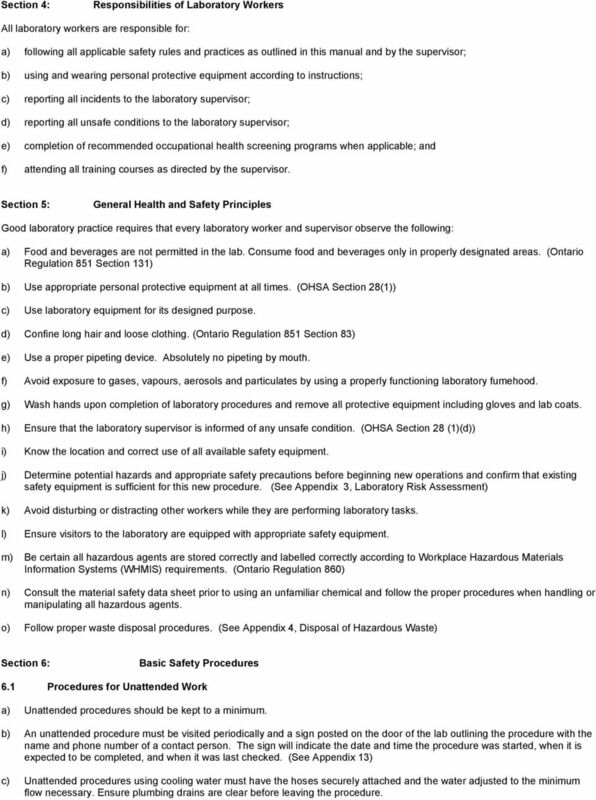 (See Appendix 4, Disposal of Hazardous Waste) 6.4 Laboratory Equipment Maintenance Laboratory equipment must be inspected and maintained by a qualified person. The frequency of the inspection depends on the hazard posed by the equipment, the manufacturer's instructions, or as required by regulations. Records of the maintenance must be kept on file by the laboratory supervisor and be available at all times. 6.5 Guarding a) All mechanical equipment must be adequately guarded to prevent access to electrical connections or moving parts. (Ontario Regulation 851 Section 25) b) All centrifuges must be fitted with an interlock so that they cannot be accessed while moving or started while open. (Ontario Regulation 851 Section 31) 6.6 Shielding a) Appropriate shielding must be used whenever an operation involves chemicals with the potential for explosion or severe splashing. Examples include: when a reaction is attempted for the first time; when a familiar reaction is carried out on a larger scale than usual; whenever operations are carried out under non-ambient conditions; or whenever a severe splashing potential exists for corrosive materials. (Ontario Regulation 851 Section 89) b) Shielding or equivalent precautions are to be used when working with non-ionizing radiation sources, magnetic and other fields. Examples include: Lasers Infrared radiation Ultraviolet radiation Microwave radiation Refer to the Radiation Safety Manual (available from EHSS) for shielding of ionizing radiation sources. c) Appropriate shielding is required when using equipment with thermal hazards. 6.7 Glassware a) Repair or dispose of any damaged glassware. Follow proper disposal procedures for damaged glassware. (See Appendix 4) b) Ensure adequate hand protection is used when working with glass tubing. 5 c) Tape permanent vacuum glassware which presents an implosion risk with either electrical or duct tape or use appropriate shielding. (Ontario Regulation 851 Section 84 (b & f)) d) Wear appropriate hand protection when picking up broken glass. e) Ensure proper instruction is given for the use of specialized glassware. f) Specific procedures may apply for contaminated glassware. 6.8 Flammable and Combustible Material Hazards a) Use an open flame only as long as necessary and extinguish it when done. b) Do not use an open flame to heat flammable or combustible materials. It is generally not recommended to perform a distillation at reduced pressure using an open flame due to the possibility of local superheating. c) Remove all flammable and combustible materials from the work area before lighting a flame. d) Notify all others in the lab and note any procedure using flammable and combustible gases and liquids before lighting a flame. e) Store all flammable and combustible materials properly as required by the Ontario Fire Code. (See Appendix 5, Storage and Handling of Flammable and Combustible Liquids) f) Avoid open flames, use non-sparking equipment and adequate ventilation if a flammable atmosphere may be generated, for example when dispensing flammable or combustible solvents. 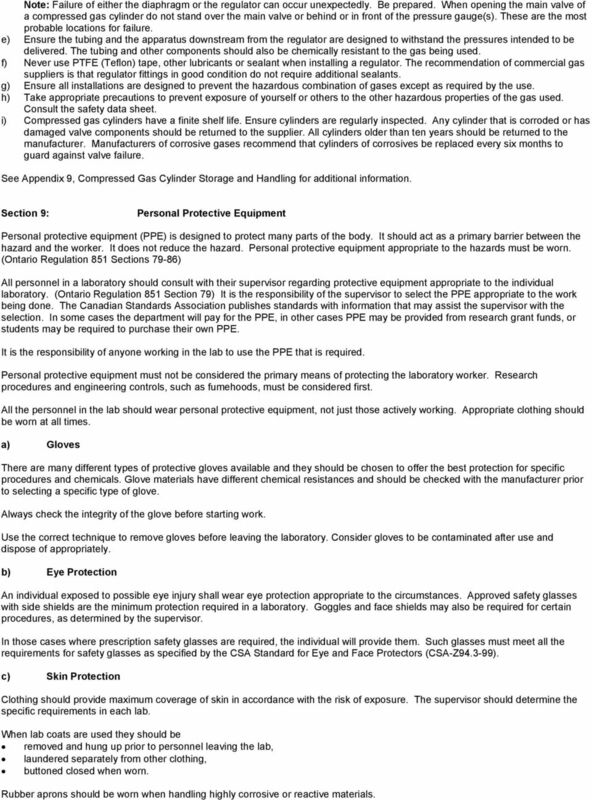 (Ontario Regulation 851 Section 63) 6.9 Cryogenic Materials and Cold Traps a) Wear proper gloves and a face shield when preparing or using a cold trap below 70 degrees C or cryogenic liquids. b) Never use liquid nitrogen or liquid air as a cold trap to collect a flammable or combustible material mixed with air. Oxygen may condense from the air and lead to an explosion hazard. c) Always ensure the flammable or combustible material is collected under vacuum. Use a Dewar vessel designed for cryogenic liquids not a regular domestic vacuum flask. d) When returning the cooled material back to atmospheric pressure, ensure the cryogenic coolant has been removed to prevent liquid air condensation. e) Use appropriate gloves when handling cryogenic materials, e.g. dry ice, etc. f) Dry ice/solvent cooling baths should be prepared carefully by the slow addition of small amounts of the solid dry ice to the solvent to avoid excessive frothing and overflow of the solvent. g) Never lower your head into a dry ice chest since a high level of CO2 may accumulate there posing an asphyxiation hazard Systems under Pressure a) Never heat or carry out a reaction in a closed vessel unless it is designed or tested to withstand the expected pressure of the reaction. b) Pressurized equipment must have an appropriate pressure release valve. c) Pressurized equipment must be shielded, guarded, or designed to protect the operator against potential explosions Back Flow Preventers a) All water faucets to which a hose is attached in a laboratory must be equipped with an appropriate backflow preventer. (Ontario Building Code) This prevents the contamination of the drinking water system. Contact the Manager, Maintenance Services at extension 8821 for an evaluation Electrical Equipment and Apparatus a) All electrical installations must conform to the provisions of the Power Commission Act of Ontario. b) All electrical equipment must be CSA approved or inspected by Ontario Hydro. c) Extension cords must not be used for permanent installations. Contact Physical Plant at 3668 to install or relocate outlets in close proximity to the equipment. d) Use ground fault circuit interrupters where there is a risk of an operator coming in contact with water and electrical equipment simultaneously. e) Only trained, qualified personnel may repair or modify electrical or electronic equipment. f) Power bars should not be located beneath work benches where chemicals are handled Compressed Gas Cylinders All compressed gases have potential health and safety hazards related to the chemical properties of the gas, as well as pressure hazards. Take precautions to protect personnel from these potential hazards a) All gas cylinders, empty or full, must be properly secured so they cannot be knocked over. Cylinders with safety caps in place may be secured together. All others must be secured separately. (Ontario Regulation 851 Section 49) b) Compressed gas cylinders should be transported capped and chained on appropriate carts. c) Always wear eye protection when working with compressed gases. d) Always use the appropriate regulator for the gas being used. The regulator should be inspected each time before use, as recommended by the manufacturer. 6 Note: Failure of either the diaphragm or the regulator can occur unexpectedly. Be prepared. When opening the main valve of a compressed gas cylinder do not stand over the main valve or behind or in front of the pressure gauge(s). These are the most probable locations for failure. e) Ensure the tubing and the apparatus downstream from the regulator are designed to withstand the pressures intended to be delivered. The tubing and other components should also be chemically resistant to the gas being used. f) Never use PTFE (Teflon) tape, other lubricants or sealant when installing a regulator. The recommendation of commercial gas suppliers is that regulator fittings in good condition do not require additional sealants. g) Ensure all installations are designed to prevent the hazardous combination of gases except as required by the use. h) Take appropriate precautions to prevent exposure of yourself or others to the other hazardous properties of the gas used. Consult the safety data sheet. i) Compressed gas cylinders have a finite shelf life. Ensure cylinders are regularly inspected. Any cylinder that is corroded or has damaged valve components should be returned to the supplier. All cylinders older than ten years should be returned to the manufacturer. Manufacturers of corrosive gases recommend that cylinders of corrosives be replaced every six months to guard against valve failure. See Appendix 9, Compressed Gas Cylinder Storage and Handling for additional information. Section 9: Personal Protective Equipment Personal protective equipment (PPE) is designed to protect many parts of the body. It should act as a primary barrier between the hazard and the worker. It does not reduce the hazard. Personal protective equipment appropriate to the hazards must be worn. (Ontario Regulation 851 Sections 79-86) All personnel in a laboratory should consult with their supervisor regarding protective equipment appropriate to the individual laboratory. (Ontario Regulation 851 Section 79) It is the responsibility of the supervisor to select the PPE appropriate to the work being done. The Canadian Standards Association publishes standards with information that may assist the supervisor with the selection. In some cases the department will pay for the PPE, in other cases PPE may be provided from research grant funds, or students may be required to purchase their own PPE. It is the responsibility of anyone working in the lab to use the PPE that is required. Personal protective equipment must not be considered the primary means of protecting the laboratory worker. Research procedures and engineering controls, such as fumehoods, must be considered first. All the personnel in the lab should wear personal protective equipment, not just those actively working. Appropriate clothing should be worn at all times. a) Gloves There are many different types of protective gloves available and they should be chosen to offer the best protection for specific procedures and chemicals. Glove materials have different chemical resistances and should be checked with the manufacturer prior to selecting a specific type of glove. Always check the integrity of the glove before starting work. Use the correct technique to remove gloves before leaving the laboratory. Consider gloves to be contaminated after use and dispose of appropriately. b) Eye Protection An individual exposed to possible eye injury shall wear eye protection appropriate to the circumstances. Approved safety glasses with side shields are the minimum protection required in a laboratory. Goggles and face shields may also be required for certain procedures, as determined by the supervisor. In those cases where prescription safety glasses are required, the individual will provide them. Such glasses must meet all the requirements for safety glasses as specified by the CSA Standard for Eye and Face Protectors (CSA-Z ). c) Skin Protection Clothing should provide maximum coverage of skin in accordance with the risk of exposure. The supervisor should determine the specific requirements in each lab. When lab coats are used they should be removed and hung up prior to personnel leaving the lab, laundered separately from other clothing, buttoned closed when worn. Rubber aprons should be worn when handling highly corrosive or reactive materials. 7 d) Respiratory Protection Under normal circumstances respirators should not be required for laboratory situations. Use of fumehoods should generally eliminate respiratory hazards. If a respirator is required, the selection should be based on the CSA Standard, Selection, Use and Care of Respirators CSA Z It is essential the wearer be properly instructed for fit and safe use of a respirator. e) Hearing Protection Hearing protection is required for noise levels above 90 dba. (Ontario Regulation 851 Section 139) The supervisor will determine the appropriate type of hearing protection to be worn. (Hearing Protectors CSA-Z94.2-M1984) Measuring can be done by EHSS. f) Foot Protection Safety footwear is designed to protect feet against a variety of injuries. Impact, compression, chemical splashes and puncture are the most common types of injuries. Footwear should be chosen according to the hazard and should be properly rated. (Protective Footwear CSA-Z195-M92) g) Head Protection Head protection is required when working where there is a risk of injury from moving, falling, or flying objects or when working near high-voltage equipment. Hard hats are designed to protect from the impact and penetration caused by objects hitting the head or from limited electrical shock or burns. Biosafety Guidelines. 5. Pipetting Mechanical pipetting devices must be available and used. Mouth pipetting is prohibited.